Vp-2750FT/SEC. Wp-0.290 LB. Wc»0.070 LB. BORE TRAVEL«4.3FT. Figure 3-17. Graph of Chamber Pressure Versus Time (20 mm Gun). liminary studies may be determined by conventional interior ballistics computations. 1. Determination of the conditions of free recoil. 2. Determination of the correct time for unlocking. 3. 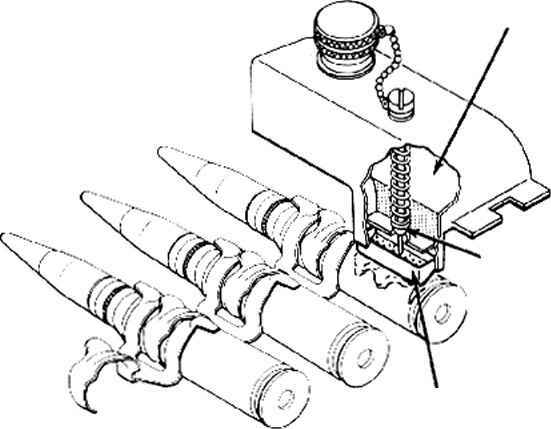 Computation of data required for design of the gas actuating device. 4. Determination of data required for timing the operation of the piston. 5. Selection of characteristics of barrel springs and bolt driving spring and determination of data for backplate buffer and buffers associated with barrel spring. 6. Development of graphs show how the velocity and travel of the gun, piston, and bolt vary with respect to time. In the course of describing these calculations, the following fundamental formulas will be developed and explained.